We provide a range of benefits for both novice and experienced runners. RRC membership can add a lot to your enjoyment of running. Go to the joining the RRC page to see details. You can also join our Facebook group, which is for members only. This includes latest News from RRC members. This book is a mine of information for both Ultra Runners and for anyone interested in distances in excess of the Marathon. RRC members can obtain a copy for £10.00 plus £1.00 p&p (uk only). Go to the Merchandise page of the Members Area to place your order. 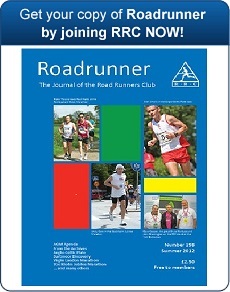 Roadrunner is the journal of the RRC and is published and sent to members 3 times a year with a wide range of content on all aspects of running. Some articles from Roadrunner can be read here. The late John Jewell, an ex-President of the RRC, has given a very generous bequest to the RRC. Select the films you wish to see from his archive from the film archive menu link above. The results for the Championships for can be viewed on the "Club Championship" tab. Please email your results to John Trory. The affairs of the Club are controlled by its constitution, which can be downloaded in PDF format by clicking here. This site has an area for members only, including: Club Merchandise; the Club's Standards Scheme; Affiliation Details; Training Tips. You get to it by clicking the top menu button "Members' Area" and will then find a page requesting your RRC number and postcode.